This is reblogged from my post at Daily Genius. Blogging is a popular activity in classrooms today because it allows students to share their writing with a broader audience and teachers to communicate with parents. There are a myriad of platforms to choose from: edublogs,Kidblog (especially good for elementary age children), Blogger, wordpress, and most LMS systems have a blogging platform built in. How to set up blogging in the classroom will depend on your platform, and is pretty easy to figure out with all of the “how-to” videos and help center collections. What teachers most often ask me is why they would set up a blog for their class. What value is there in a class blog? Here are some great ideas and applications for class and/or individual student blogs that you can explore in your classroom. Blogs can be set to private, public, and shared with specific individuals or groups. This makes them a great platform for students to build their own ePortfolio. They can curate their content first for teachers and parents before publishing it to a broader audience. As a blog allows for not only written content, but multimedia material (images, videos, interactives, etc), it makes it possible for students to create a robust online presence. Kristen Wideen uses Kiblog for her elementary students to create digital portfolios; you can read more about her experience here. If your students are making videos, creating science fair projects, writing poetry, or other creative content, then a blog is a great way for them to showcase their work. By allowing (moderated) comments, students have an authentic, broader audience that they are addressing. Imagine students who are participating in Poetry Month posting their participatory works online and getting feedback from poets around the country! TheBurlington High School Help Desk (staffed entirely by students) hosts a community blog where they post information about themselves, helpful hints, reviews for new apps and tools, individual projects, and much more. By engaging a broader audience, students learn about digital citizenship and safety while online. Because blogs allow for threaded discussion, they are an excellent platform for discussion. One of my favorite exercises in Social Studies is to post a news article along with some guided questions (the New York Times Learning Network has great tools for this). Students then engage in an online discussion about the topic. Not only does this promote critical thinking and writing skills, but it is an excellent diving board for discussions on Digital Citizenship. If you have students working on groups projects or in class labs, especially ones that take several weeks and exercises, then blogs are an excellent way for them to record and report on their progress. Imagine students working on a Biology Lab that encompases a quarter or semester-long project. As a group, they report their findings, measurements, and progress each step of the way. If the blog is shared with the class, then they have an audience that is also monitoring their progress, not only learning from their peers but also providing oversight for errors. These are just a few examples of activities that you can use blogs for in your class. Explore how blogging can work in your class and try some of these examples from EdTechTeacher. LOOKING TO LEARN MORE ABOUT BLOGGING IN THE CLASSROOM? COME JOIN US THIS SUMMER! This entry was posted in Education, Educational Resources, Educational Technology, Social Media, Technology and tagged Blog, blogging, Ed Tech, EdTech, Education, Education Technology, Social Media, Technology on April 28, 2015 by Jennifer Carey. My school uses edubologs as our primary blogging platform. Just a month ago, they announced a massive upgrade that, much to my eagerness, included activation of the Thinglink widget. Thinglink is an online tool that allows you to create dynamic, embedded images out of your own images. As such, you can take a stagnant image and create a dynamic, multimodal project. We are finishing up the American Civil War in my U.S. History Class. The Civil War was the first, broadly documented war in American History. There are repositories of tens of thousands of images through the Library of Congress, the Smithsonian Institution, and various other private and public institutions. Thus… my students had a project. They were assigned to find a meaningful image (not necessarily of a famous individual or event, but an image that had purpose) and to expand upon that image using multi-media. The image must be properly cited and and license-free (if you would like to learn more about finding license-free images for your classes, see my post: “Find Free and Legal Images for your Classroom“). They then had to post this image on our class blog along with a brief paragraph highlighting why they chose this image as well as demonstrate critical assessment and thought in curating content to embed. In other words, don’t just throw together a bunch of links on an image. This allowed students to explore Digital Literacy in conjunction with performing individualized research on the Civil War. They then presented these projects to the class. This entry was posted in Education, Educational Resources, Educational Technology, History, Lesson Plan, Pedagogy, Social Media, Technology, United States History and tagged Blog, Digital Citizenship, digital literacy, Edublogs, lesson plan, Library of Congress, Smithsonian Institution, Social Media, thinglink on January 23, 2014 by Jennifer Carey. Here is a great list of blogs for educators to follow! NPR: Education – This is National Public Radiod’s section on education. It addresses concerns about public education, academic trends, and general news about education. Tech & Learning: Ideas and Tools for Ed Tech Leaders – Some great ideas on how to implement technology in the classroom addressing topics like STEM, Common Core, tools, etc. Mathy McMatherson – A great blog by a teacher of math in an underprivileged school in Arizona. Tech Tips – Technology Tips for Elementary School Teachers – A wonderful blog hosted by my colleague Karen Arrington. She focuses on effective adoption and implementation of technology in an elementary environment. Powerful Learning Practice – Voices of the Learning Revolution – A blog by educators, administrators, and other educational leaders with a primary focus on connected learning. 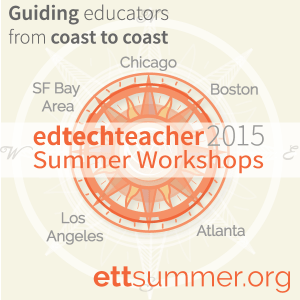 Ed Tech Teacher Blog – The blog hosted by the Ed Tech Teacher team and focusing on a variety of educational technology topics. ISTE Blog – The official blog for the International Society for Technology in Education. It focuses on a variety of topics of education in technology throughout the world. CUE Blog – Official blog for Computer Using Educators (CUE). 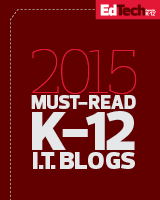 It focuses on a variety of educational technology topics. Cool Cat Teacher – A great blog by Vickie Davis, a full time educator and prolific writer. What I love about her blog is the personal element. 2¢ Worth – The blog of the “grandfather of educational technology” David Warlick. He focuses on the changing landscape of education. KQED Mind/Shift – covering cultural and technology trends, groundbreaking research, education policy and more. 21K12: Exploring & Celebrating 21st century Learning – Focusing on trends and pedagogy within 21st century learning. Huffington Post: Education – Huffington Posts’ Education section. Education Week – Weekly publication on all things education. Their blogs update daily. This entry was posted in Education, Educational Resources and tagged Blog, blogging, Education, Educational Technology on April 10, 2013 by Jennifer Carey. As of late, I’ve been trying to use less paper and to encourage my students to do the same. I certainly have not become paperless, but I have eliminated a lot of my paper-useage. I would love to continue this trend and still am looking for some alternative options to go wholly paperless. I still collect some written homework, students still work with their hands, and I still find reading/editing on paper easier than digitally. Still, there are a few options for me. One, when possible, I ask students to post on the class blog as opposed to handing in an assignment. This is especially good for tasks that I would like them to share. This way, they can also easily add links, pictures, and even videos. It’s still not great for all assignments and requires internet access. Currently, my students do not have access to computers & the internet 100% of the time (we book computer lab time), so this generally requires some advanced planning (at least a few days). Also, a lot of my students do their homework on buses to/from extra-curricular activities (often not getting home until 9 or 10 pm). so, this is not always feasible. At my husband’s school, many students do not have computers at home. This is still a work in progress for me. I’m finding things that work and others that do not work. Plus, I have some students that are very excited about it and others not as thrilled about the technology aspect. This is also a great way for students to share their assignments with one another (something I like them to do in Art History). In all of my classes, I supplement with primary source readings, activities, work-sheets, whatever I feel a particular lesson calls for. I’ve started to distribute these in advance electronically and encourage my students, whenever possible, to not print it up – rather to access it electronically. This is not feasible for everyone, but the 70% with Smart-Phones use them in class. Again, DropBox is a great tool for this – especially as many of the files I distribute are too large for email. I like to save them in PDF (Portable Document Format), and then I put them right into our “Shared” DropBox folder. To access these, students have a few options. They can use a free PDF Reader like Adobe and then download, open, and print to bring to class. If they have a Smart Phone or a Tablet, they can download the free DropBox Application, download, and read electronically in class. If they would like to take notes on their electronic copy, they will need an application like PDF Reader Pro or iAnnotate. These will allow the user to highlight, make notes, and more. Perhaps the greatest arena of waste of paper is the copier. I’ve made too many copies, not enough, photocopied the wrong thing, dealt with mis-feeds, and seen so much paper thrown in the trash. Likewise, I’ve seen my students make a few dozen copies and then promptly toss them in the trash. One solution for copies in the library is to encourage students to use their Smart Phones to take photos instead of make copies. There are several applications that will do this, my favorite are Genius Scan – PDF Scanner. This application will allow you to take pictures and convert them to PDF. It is specifically designed for use on documents, so it will focus and improve resolution to enhance text. Additionally, you can upload to DropBox or Evernote, email it to yourself, or simply store it on your device. There are a lot of other applications that do the same: DocScanner, ScannerPro, Document Scanner, and more. Not only great for my students, but I can use them in lieu of the copy machine myself. These are only a few of the tools that I’m using. I’d love to hear others. This entry was posted in Education, Educational Resources, Educational Technology, Pedagogy and tagged Blog, DropBox, Ed Tech, Education, Education Technology, Evernote, Green, paperless, Pedagogy, Scanner, Wordpress on October 27, 2011 by Jennifer Carey. I originally posted about my desires and plans to use blogging in the classroom in my post: “Blogging in the Classroom.” I felt that this was important for my students for several reasons – the rise of blogging in college classrooms really put me over the edge. So many of my former students and colleagues (that had returned for first or additional graduate degrees) were telling me that online assignments and class blogs were becoming the norm in 21st century education. They told me that the greatest challenge for them was simply learning how to use the tools – the less exposure to computers and online tools, the steeper the curve. And of course, as many of us who have been through the college experience, know – it is a rare College Professor that will hand-hold you through the learning process, or even patiently walk you through the process. They expect you to already know it (as part of your own college preparation) or expect you to learn on your own. With my 9th grade class, we have a weekly assignment called “Current Events in History.” They have to go out weekly and find a “historical news story.” It can be about a new book coming out, an archaeological find, the destruction of a monument in war, etc. They must prepare an oral presentation (with a PowerPoint slide) and do a summary write up for the class blog. Also, they choose the topic on a ‘first come first serve’ – that means they have to check the blog before they post to ensure that they don’t repeat a classmate’s story. Their blog post has to be at least 100 words and include the source. They seem to have really taken to this. What I have seen is that they are better at collaborating (they will tell me before I get a chance if a classmate has ‘taken’ their story), becoming better public speakers (they have 2-5 minutes of practice every week), are better ‘casual’ writers (although sometimes I have to remind them), and are becoming more adept at finding reliable resources. They can also get up to 10 points of extra credit on the assignment for commenting on a classmate’s work – still not getting a lot of collaboration there. This entry was posted in Education, Educational Resources, Educational Technology, Lesson Plan, Pedagogy and tagged Blog, blogging, Class Blog, Class Blogs, Ed Tech, Education, Educational Technology, lesson plan, Pedagogy on October 2, 2011 by Jennifer Carey.